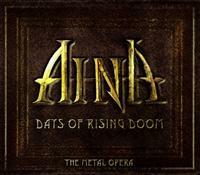 AINA presents the ultimate Symphonic Metal Opera in a deluxe format of 2 CD's, DVD & a 72 page eco-booklet! An epic story conceptualized by over 30 musicians including members of RHAPSODY, ANGRA, EDGUY, EPICA, BLACK SABBATH, AYREON, HELLOWEEN, DEEP PURPLE, NIGHTWISH, STRATOVARIUS, YNGWIE MALMSTEEN, DREAM THEATER, ALICE COOPER, KISS & many more!! !